Day four broke and the first thing I noticed was the stench in my bedroom. I’d noticed it a bit the previous night in Rhyader but there was no escaping it today. My damp cycling shoes were disgusting; and still wet. I left the windows open whilst I went downstairs for a decent enough breakfast. I can’t say the smell had completely vanished by the time I got back to my room and packed the bags ready to start the next day. Looking out of the hotel window the weather wasn’t showing any signs of allowing the shoes to get properly dry today. It was a wet drizzly start to the days ride. If yesterday was about the two mountain passes either side of Machynlleth, today was to be a day for castles. After a short stretch along Barmouth sea front the route joins the main A496 coast road for a few miles. Despite being a main road it wasn’t overly busy and the riding was pleasant enough with just enough ups and downs to get the legs moving again. In order to fit in enough time for masonry I stuck on the main road between Dyffryn and Llandanwg rather than stick to the official route. 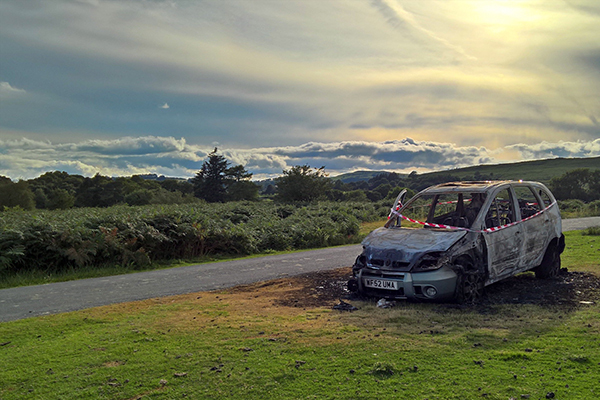 A back road from there led me into the middle of Harlech and right next to the Castle entrance. Harlech Castle has a new visitors centre at the entrance with shiny new bike racks so I happily locked the bike up and, even better, the very nice lady at the ticket desk was happy for me to leave my paniers with her. I love Harlech Castle. I could have spent hours there but wary of the time I kept myself to a rationed time limit – after all I didn’t want to miss out on the other castles ahead of me. The weather was still gloomy at this point which gave me an easy answer to one dilemma. The official LLC route does not actually pass through Harlech, but there was no way on earth I would pass within a mile of the castle without a visit. Upon leaving I therefore had the choice of whether to drop down and back onto the main coast road or climb a steep lane up the hills behind the town to re-join the official route on its way to Porthmadog. The weather made the choice easy. The reason for the official route would be the views. There weren’t likely to be any this morning so I headed for the main road. WARNING: To anyone riding this way be wary of the level crossing by Harlech station. The tracks cross the road at enough of an angle to look safe, but not so much as to prevent a wheel falling into the rail bed. My rear wheel got stuck straight in and without realising it I was arse about face on the side of the main road with my feet still locked into the peddles. Fortunately the main damage was pride. Other than a minor scrape on the knee I was fine. A kindly lady stopped her car to check I was OK. I was; but how was the bike? My bell was dented and I had lost a piece of plastic that protects a gear indicator. There were also a few holes in the handlebar tape but otherwise things looked ok and fortunately the wheels had escaped unharmed. Phew! My luck was in and so gathering up my dignity from the road I got back on the way before too many more people might notice. Once moving again the next few miles were glorious easy flat riding most of the way into Porthmadog. A charming little town with a pretty harbour and a couple of steam railway lines radiating out this is another town where those with time to spare might break a day or two taking the train towards Snowdon before hiking to the summit. For me though there just the time for a pot of tea and a slice of cake in the station café and a quick look around one of the trains which would soon be headed for Caernarfon; as would I. Having already deviated some way from the route already this morning I chose to continue to avoid some of the extra miles of the official LLC and followed the A497 into Criccieth. This was a pleasant enough diversion; the road wasn’t busy and had a good mixed use path along most of it. Descending into the town the castle wasn’t hard to spot. The bike was soon locked up by a tree and again the kindly Cadw staff allowed me to leave my panniers by the ticket desk. I’d somehow never been to Criccieth before. Even though it is a much smaller castle (originally one of Llewellyn’s Welsh Castles before being taken and strengthened by Edward I) I spent as much time looking around here as I had done at Harlech. I was particularly pleased to see the pictures of the excavations at Dolforwyn Castle featured on boards in the visitor centre and although I wasn’t on any of them myself, a good number of friends are pictured. The Dolforwyn Castle excavations were where I spent my university summers as a part of my Archaeology degree and I’ve been going back almost every year since with friends; even though the excavations finished years ago. Leaving Criccieth I kept with my diversions and followed the B4411 on a more direct route towards Bryncir. A rolling upwards road was nice and easy going and I was soon in the village where I finally re-joined the cycle route as it follows another old railway line which slowly continued to rise for a couple of miles before beginning a lovely smooth descent back down towards the coast. The final few miles the railway line from across the mountains runs alongside the cycle path. Just short of Caernarfon the train I had seen at Porthmadog came alongside and past me. Coming into Caenarfon I noticed an unseemly rattle developing from the rear of the bike. A quick look indicated that one of the screws holding the rear rack in place had worked itself off (I’ve had trouble with that before). 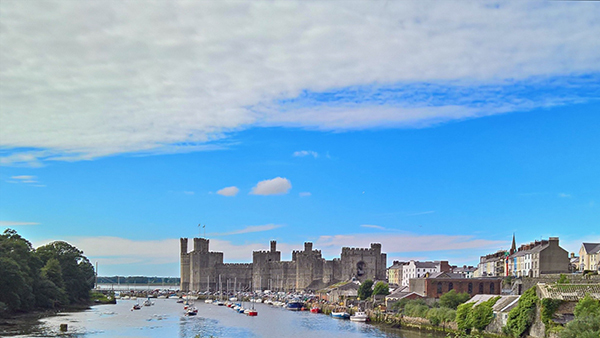 A friendly LBS just near the end of the railway line were able to get me a replacement screw and I also added a cable tie to make sure, and then I wheeled my way to the majesty that is Caernarfon Castle. I could write a whole separate piece on just how great a castle it is and how it was probably the greatest castle ever completed in the UK (Beaumaris might have been better had it ever been finished). I’ll spare you the details here. Another friendly castle gateman allowed me to leave my bike in a garderobe next to the ticket office thus allowing me a good wander around the castle. The sun was out quite strongly now and everything was right in the world. It had been about 5pm when I arrived and the castle was closing at 6 so my time did have some limits; so a short time before closing I recovered the bike and left. 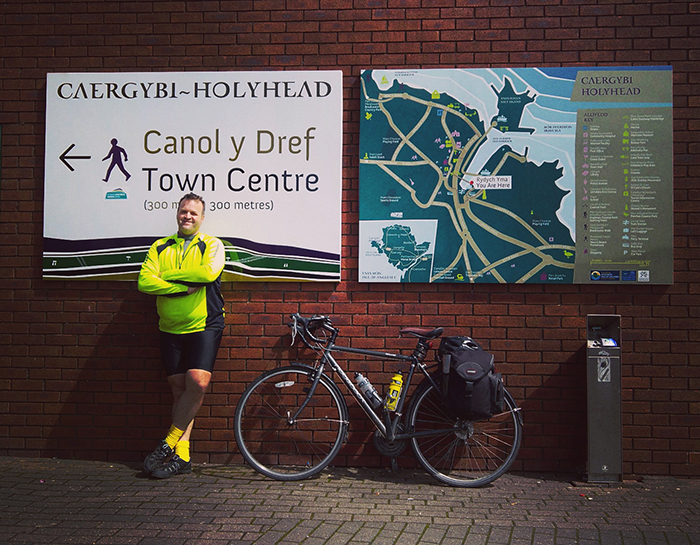 The cafes of the town had shut by now so I ate a Babybel and a handful of Jelly Babies and set straight off on the last few miles towards Bangor; the end of the day’s ride. 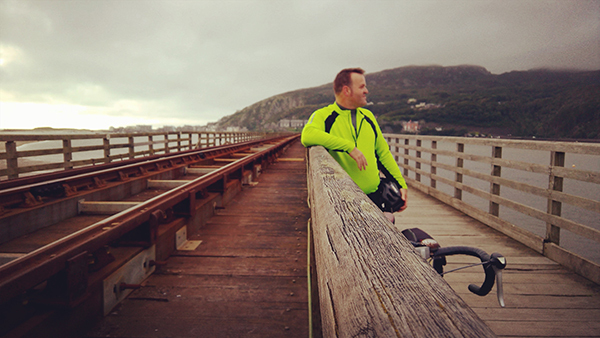 Most of this stretch was nicely along old railway lines and other easy going tracks following the Menai Strait. Y Felinheli was particularly pretty although from there I followed cycle paths next to the main road into the centre of Bangor.